The vibrant city of Bangkok appeals to people of all ages and from all walks of life. In fact, there is so much to see and do in Bangkok that first time visitors may have trouble knowing where to start. Here are a few things that should not be missed. Bangkok is famous for its elaborate Buddhist temples and there are dozens of impressive structures that are just waiting to be explored. Some of the biggest and most popular temples include Wat Arun, Wat Phra Keaw and Wat Po, which is home to the colossal Reclining Buddha statue. The Chao Phraya River is the lifeblood of Bangkok and many of the city’s famous attractions are nestled along the river banks. Visitors will be able to admire several interesting attractions as they gently glide along the river including Chinatown, Wat Arun and the flower market before disembarking at pier 13 to explore Khaosan Road. Khaosan Road is popular hangout among backpackers as well as Thai students. The main street is lined with market stalls that sell clothes, souvenirs and travel essentials, while there are also plenty of cheap guesthouses and hostels to be found there. However, Khaosan Road has been revamped a little in recent years and the area now boasts a selection of great restaurants as well as more up market hotels, bars and clubs. People who want to indulge in a spot of shopping should check out the world famous Chatuchak Market, which is open every weekend and features hundreds of stalls selling just about everything imaginable. Bangkok’s large and lovely parks are great places to relax and unwind for a while. 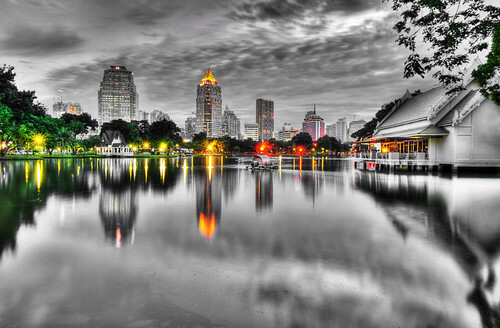 The largest and most accessible parks are Lumpini Park and Chatuchak Park, both of which feature large lakes where visitors can ride peddle boasts as well as picnic areas and fitness zones. Just behind Chakchak Park is Railway Park, which is home to a large and well-maintained butterfly centre. Bangkok is also famous for its street food and dining at one of the many food carts that can be found at the side of most main streets throughout the city is by far the best way to try traditional Thai food. There are dozens of different dishes to choose from and street food is extremely cheap, which means that visitors can afford to experiment a little. People who like to dine in style will also be impressed by the number of top end restaurants that can be found in Bangkok. Hungry visitors can take their pick from everything from authentic Lebanese cuisine to gourmet Thai food and Western cuisine, all of which is served in sumptuous settings. unes on the decks. The vibrant entertainment district of RCA contains dozens of fantastic night clubs, while of vibrant night club spots include Sukhumvit soi 11 and Thong Lor. Baiyoke Tower is the tallest building in the whole of Bangkok and offers stunning views of the entire city. Visitors can make their way up to the revolving viewing deck to take in impressive panoramic views of the city that they will never forget. This atmospheric attraction is one of Bangkok’s newest entertainment venues and combines shopping, dining and sightseeing in a stunning outdoor setting at the side of the Chao Phraya River. With a host of airlines offering cheap flights to Bangkok, it’s becoming a more and more accessible destination. And, of course, this is just a small selection of the city’s exciting attractions. One of the great things about Bangkok is that brand new attractions open up all the time, which means that visitors will always find something new to discover.